Interchangeable button profiles meet different needs. It’s always been hard for me to recommend Razer’s Naga line, not because they’re bad mice but because they’re not the mice for me. They’re specialty hardware, not Swiss Army knives. 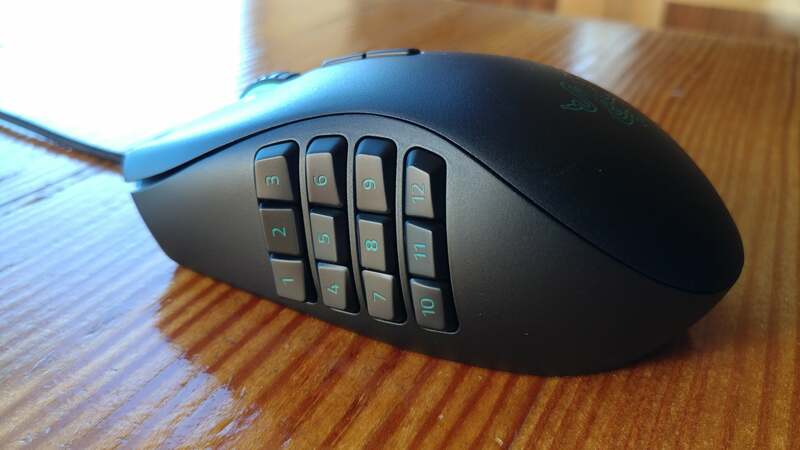 The original Naga and its telephone-style numpad was designed for MMO players who need a lot of shortcut keys. The Naga Hex was a compromise of sorts, with half as many buttons in a much more intuitive, ring-shaped layout. But both always seemed overly complicated to me, especially for day-to-day use. What if you didn’t have to choose, though? What if you could get the 12-button, six-button, and a standard two-button layout from the same mouse? Enter the Naga Trinity. Okay, here’s the downside: It’s still a Naga. I don’t mean to sound flip, but Razer’s MMO mouse has never been my favorite design. Short and wide, it doesn’t really feel comfortable in my hand whether I opt for a palm or a claw grip. It’s neither long enough for the former nor thin enough for the latter—at least in my experience. To each their own though, and if you like the Naga, nothing’s changed. 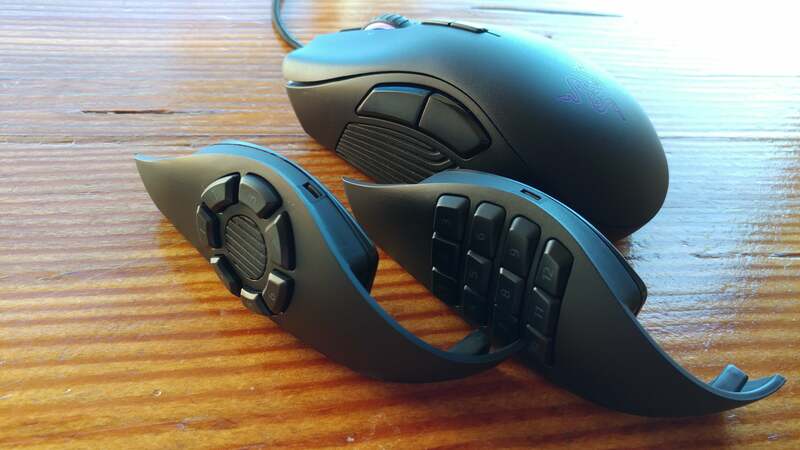 The Naga Trinity is the exact same shape as the 2014 edition, with an overemphasized ring finger/pinky grip and the two DPI buttons behind the scroll wheel. It also has Razer’s RGB lighting in all the usual spots—which is to say on the scroll wheel, on Razer’s logo, and on the left-hand side. Which brings us to the most important feature of the Naga Trinity: that left-hand side. As alluded by the name (and in my intro), the Naga Trinity is actually three different mice in one. The left side of the mouse is entirely interchangeable. You’d never know it simply by looking at it—it’s well-disguised. But the whole panel is held on by two small magnets, and peels off with a small amount of force. A few gold contacts let the mouse know which panel’s connected, and that’s it. It’s easy. I’ve used plenty of customizable mice in the past few years, but most stick to nonfunctional parts of the chassis—allowing you switch out the thumb rest, for instance, but not the buttons themselves. And the mouse that did let me change button layouts, the Roccat Nyth, required tediously replacing the buttons one at a time by hand. The Naga Trinity is quick and painless enough that I’ll actually take advantage, and it gives you options. The default Naga Trinity, of course, is the 12-button numpad design Razer made famous years ago. As with the 2014 version, each of these buttons is a slightly different shape to help make them easier to sense with your thumb. Not that it’s much help—I remain very impressed by anyone who can use the 12-button Naga efficiently. In any case, that setup gives you a full 19 buttons—the 12 on the side, plus your usual left-, right-, and middle-click, the DPI buttons, and the tilting scroll wheel that debuted on the 2014 Naga. Too many buttons? Peel off the 12-button Naga design and you can replace it with the Naga Hex setup, which arranges seven buttons in a ring around your thumb. This is the Naga I prefer. It’s not my favorite button-heavy mouse, but I find it a lot more intuitive than the 12-button Naga. The muscle memory is a lot easier to develop, moving your thumb in the direction of a button instead of trying to discern between rows of similar keys. And let’s be real: Seven thumb buttons is more than enough for most people. I’m usually happy with two. Still, the extra utility does come in handy sometimes. 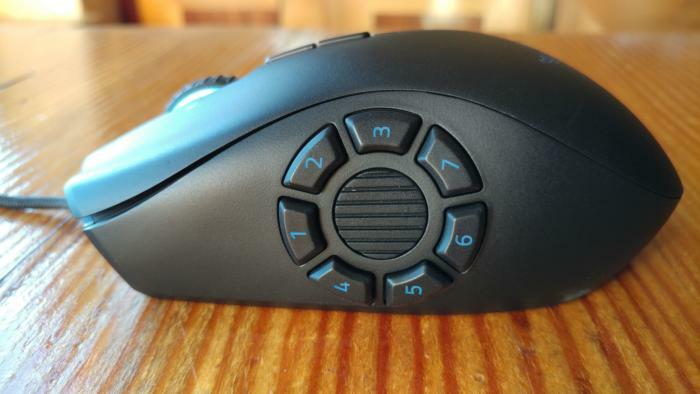 Razer marketed the Naga Hex design as a MOBA mouse, but I’ve also found seven buttons useful in strategy games and battle royale games, genres with lots of keyboard shortcuts. Both Playerunknown’s Battlegrounds and Fortnite have a lot of commands I wouldn’t touch on a keyboard but will take advantage of when they’re conveniently mapped to a thumb button. Seven buttons is probably too many for day-to-day use though, and this is the Naga Trinity’s real appeal to someone like me: You can swap in a standard two-button panel instead. 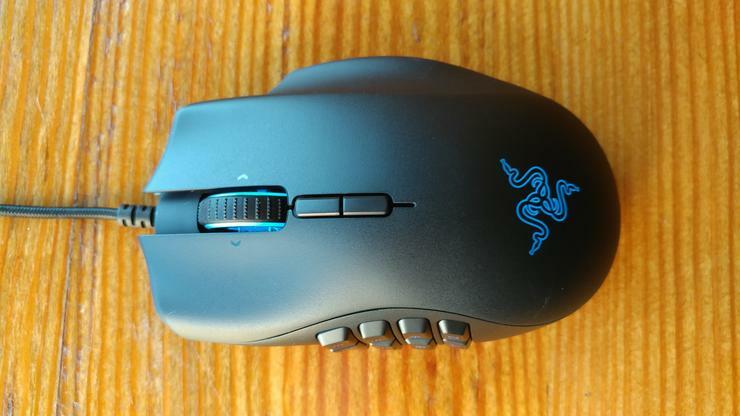 It’s still the Naga shape, so this won’t ever replace Logitech’s G502 or whatever as my favorite. But if you’re a fan of the Naga and have wanted a simplified form for shooters, puzzle games, or whatever—basically, a mouse that doesn’t threaten to trigger twelve hotkeys every time you move it around—this stripped-down panel seems like a treasure. It takes the Naga from a niche novelty mouse to a jack-of-all-trades, suiting it for practically any activity you throw at it. And for the first time, I can say the same about the sensor too. Up to now, the Naga’s used Razer’s old laser sensors. The Naga Trinity is the first to use an optical sensor, presumably Razer’s PWM3389, a semi-proprietary take on the PWM3360. The main difference is it goes up to 16,000 DPI, but chances are you’ll never touch that high-end. All you really need to know is it’s a variant of a damn good sensor, and a major upgrade over the old laser-equipped Naga and Naga Hex. The main sticking point is the price. Listing at $100, the Naga Trinity costs a fair bit more than most wired mice. On the other hand, it costs quite a lot less than three wired mice, which is sort-of what you’re getting in the Naga Trinity package. If you’re the type of person who only sometimes wants an MMO mouse, the Naga Trinity is an interesting alternative to buying and maintaining two separate devices. 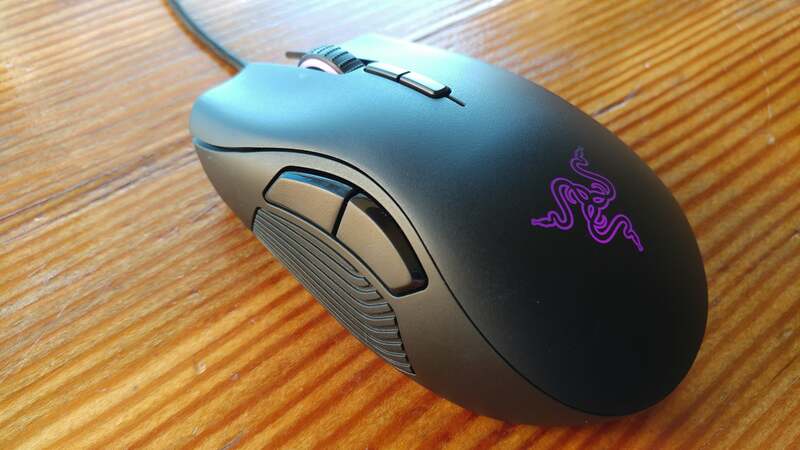 Now I’d love to see Razer go the other way and make a DeathAdder Trinity or a Mamba Trinity—give MMO mouse fans the choice of a different shape, while keeping the Mamba or DeathAdder’s strengths. That would be quite a proposition.